Our skillful craftsmen design and develop the range with a wide variety of attractive beads. Available in elegant patterns and designs, these products exhibits authentic gist of Indian jewellery. These hearts delighting jewellery are offered at reasonable prices. The state-of-the-art infrastructure of our "P. B. Chopra Impex." is established to manufacture, process and supply unmatched quality collection of High Quality Crystalized(Glass) Stones and Jewellery. 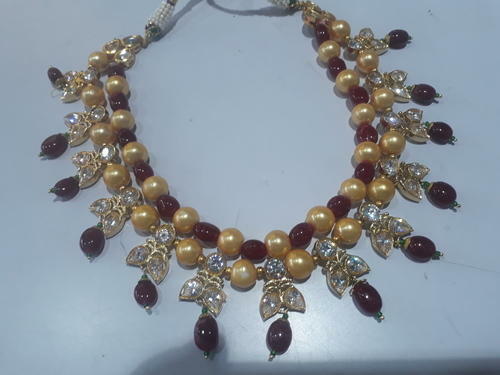 In addition, we also provide our customers handmade & casting jaipur jewellery like chand bali, kundan-meena jhumka, colour stone tops- earrings,Antique Beads Necklaces, CZ Jewellery, Gold Leaf Work Jewellery, Glass Stones,hydro stones,dublet stones, Temple Jewellery and many more products. Our team of experienced and skilled craftsmen, with the aid of the most modern production and design machinery, we can process and manufacture innovative and appealing High quality Crystalized( Glass )Stones and Jewellery products conforming to the highest quality specifications. Our extensive production unit is well equipped with quality analysis unit, we also have research and development team and adequate warehousing and packaging facilities. This enables us to manufacture and deliver properly customized defect free products to our clients all over at unbeatable industry prices.